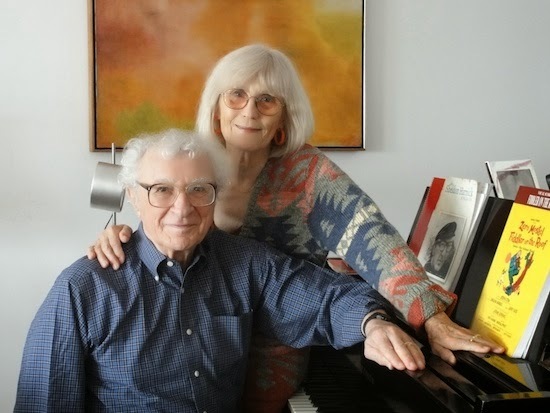 My father likes to tell the story of Leonard Bernstein asking David Nadien how it is he has such a gorgeous vibrato, to which Nadien responded, "fear." Here's a great collection of David Nadien's recordings (with sample sound clips). If music be the love of food, write on! Michael and I had some tremendous meals while we were in New York and New Jersey last week. One was in an Italian restaurant called "Tony's" in Wayne, New Jersey where the chef (named Anton Testino) is one of the competitors on this season's television show "Hell's Kitchen." We went there while the show was on the television, but very few people were watching because the food was just so good. I had a risotto with scallops and figs. There were more meals, all of them memorable, but the most spectacular one was at Cucharamama in Hoboken, New Jersey. I could call the chef, Maricel Presilla, a Renaissance woman, but with her background as a Medieval scholar, it might make more sense to connect her with everything spicy, interesting, creative, and sensual from the the Iberian Peninsula during the Middle Ages. Maricel is a good friend of Jim and Luanne Koper, our dinner companions, so we got to meet her. After returning to Charleston I sat down at the piano to play some Beethoven, and all of a sudden I had a Cucharamama-inspired musical idea, thus ending my "sabbatical" from writing music. Maricel's cookbook will be arriving in tomorrow's mail. Styra Avins sets the record straight about Johannes Brahms. Winter was hard, and the trees know that in order to survive another one like the long doozy we had they need to put out great numbers of seeds. Before we left for New York and New Jersey last Sunday the seeds on our Red Sunset Maple were dropping and spinning through the air, and now, a scant week after we left an almost late-wintery midwest, they have taken root. We came back to intense birdsong: beautiful, lively, and constant. The birds are enjoying the bounty of the trees and singing to one another. The flowers have burst into bloom, and the air smells wonderful. I imagine that there are birds in New York City, where we spent several days walking to and fro, but I didn't pay attention to them because I couldn't hear them with all the city noise. (I do enjoy the collage of city noises, and while in the city my attention is always drawn to things synthetic because around here we have little in the way of city glitter.) Sibelius once remarked about the birdsong of a country influencing the music that people write. I think that's true of all the sounds that surround us (right now the birds outside my window are being accompanied by the steady hum of a mower). In a few minutes I'll be adding to the musical activity with some viola scales. Chip Michael has some excellent observations about present and future audiences for concerts. I suppose that I have spent the last 15 years or so turning nearly everything I have experienced, in one way or another, into music. My journey into serious composing began, once I had amassed the tools to do so, as a kind of chain-writing backlog of everything I experienced musically since childhood. After exhausting my backlog, which took about five years, I would turn pretty much everything I learned into a new piece. I have come to a point where nothing of value seems to be coming out. Every time I sit down to write these days it comes up as a vague rehash of something I have already written, and it makes me feel pretty lousy. So I have decided to take a kind of sabbatical. It's a learning sabbatical, where I allow myself to read poetry without thinking about how I would set it to music, read novels without thinking about turning them into operas, and playing great music without trying to figure out what makes it great and how I might possibly absorb some of its greatness. My pre-sabbatical output is 77 compositions published by Subito, and 64 compositions that I have in the IMSLP. There's one more that I'll be putting in at the end of July, after it's performed by our Summer Strings orchestra. That makes 142 compositions (some of them long, like my so-far-unperformed operas, and some of them very short). I'm proud of the body of work I have produced at this point (if you click on the above links, you can see it in all its pre-sabbatical glory), and I am really enjoying the unburdened feeling of not having to produce more right now. There seems to be more room in my head these days. I even sound better and am more engaged when I play the violin and the viola. I suppose I have approached the work of being a composer in a kind of backwards (or back woods) way. I know I don't do enough (if anything) with the "business" end of composition, like trying to impress upon people how important it is for them to perform the music I have written. I'm lousy at business. I don't befriend people who have clout in the current musical world because of what they can do for me. I don't toot much of a horn (writing posts here is the best I can do, folks), and I seem to give opinions (on line and in print) that are not really in keeping with what people want to hear. It's odd to see the changing of the seasons on the musical on-line world. Perhaps 50 people might glance at this post over the next few weeks or months. A few years ago it would have been at least 200, and many of the people reading would respond to what I wrote, either through comments or through another blog post. We college instructors complain about the lack of engagement we see in our students, but those of us who haven't been students for decades are guilty of the same lack of engagement with the bits of information that flash across our screens, quickly seen, and quickly forgotten. I hate to engage superficially in any way, and am horrified when I find myself doing so. It is very easy to slip into the habit of superficiality when so much of our daily interactions are accomplished through light-emitting devices. I wonder, once the internet starts to slow down, and those of us who do not have the means to pay for a ticket to the fast lane, if we might reconsider alternative ways of interacting. I rarely buy CDs because my cup runneth over (and my shelves as well) with recordings I get for review, but immediately after I heard this interview on Fresh Air with Sheldon Harnick (recorded on his 90th birthday, which happened to be April 30, 2014, the same day as my 55th) I went to The Musical Theater Project's website and ordered a copy. The 2-CD set is loaded with demo recordings of many songs that didn't make it into the final versions of the many Broadway shows Harnick wrote with Jerry Bock, including a few pieces that didn't make it into their most famous collaboration, Fiddler on the Roof. Harnick, who is a fine singer as well as a brilliant lyricist, sings on most of the demo recordings (most often with Jerry Bock singing and playing the piano), but there are appearances by Charlotte Rae, Hugh Martin, Betty Garrett, Buster Davis, Claiborne Cary, Danny Meehan, Susan Watson, Buster Davis, Leigh Beery, William Tost, Brian D'arcy James, Audra McDonald, and Margery Gray, who is married to Sheldon Harnick. Much of the music comes from the late 1950s through the early 1970s, but there are recordings from the later 70s through 2013 here as well. I admire all of these "Hidden Treasures," and there are some I have grown to love deeply. "Precious Little" is from an adaptation of the film It's a Wonderful Life that Harnick wrote with Joe Raposo. The show never made it to Broadway because a typographical error in the contract made it impossible for the show to be produced in New York. "'Til the Bootlegger Comes" and "Where Do I Go From Here," (one of the best Broadway ballads I have ever heard) were written out of Fiorello, the first highly-successful show Harnick wrote with Jerry Bock, but they have new life here. Perhaps "Where Do I Go From Here" is just too strong a song for any environment other than a recital of great art songs. The song I listen to daily (and have going through my head while I'm not listening to it) is a 1978 collaboration with Michel Legrand (who plays the piano on this recording), Harnick, and Margery Gray called "My Star." It was a song from a film project that was cancelled, but they recorded "My Star" anyway. I'm so grateful. My favorite line from that song: "I dream of steam." Sometime during the first decade of the 21st century a friend referred to her life outside of our town and her work as college professor as her "sidebar life." Now that the concept of the "sidebar" has pretty much withered away from the usual on-line experience (blogs and websites still have sidebars, but fewer and fewer people seem to pay attention to them). Many people, including me at times, have double lives. We have the life that involves the people we interact with in person, whether at work, play, or at home. Then we have our virtual communities, which sometimes involve commerce. Then we have our communities of social media friends, who are not necessarily people we spend time talking with, even though we might live in the same town or occupy the same work space. We seem to be bound to our various cultures by our devices, and our virtual cultures (or cultures of "stuff") have become so rarified that it seems there is very little in the way of actual (if I can even use the word "actual" to refer to something different from "virtual" at this point) culture that serves as a point of reference. There are only a few elements of culture that seem to affect all the people in proximity to me, but except for the weather, which is always a surprise these days, they are hard to find. There seems to be one thing that unifies everyone under the age of 40 and most people under the age of 80: cell phones. Cell phones (and computers, tablet and otherwise) seem to be the entry point for just about everything concerning culture. At rehearsal breaks it seems that everybody under the age of 40 communes with their virtual world by way of a cell phone. There are sometimes people I would love to speak with, but I feel like I'm interrupting something when I invade someone's cellular space. The cell phone seems, in many ways, to push away possibly activity in the non virtual world. In some ways, partly due to social media (i.e. Facebook), we know too much about one another, so actual real-time personal talk can seem superfluous. My college students no longer seem to recognize cultural references. Television used to be something that provided a great deal of cultural common ground, but that is no longer the case. I suppose that people who watch the same shows have a kind of community, but that community is more virtual than real. I even notice an ambivalence to cultural references. Perhaps my students are lost in a digital polyculture, and they don't have the ability to recognize landmarks on a "map." Then again, there is no map. A few years ago I played Copland's "Hoedown" from Rodeo for a class. The students all seemed to be engaged, and one student even responded by enthusiastically saying, "Pork, the other white meat" because he recognized the music from a television commercial. I responded, "Beef, it's what's for dinner." Everyone laughed, and a good time was had by all. Today I played Bonaparte's Retreat, and followed it by "Hoedown." Sure. The cultural context I gave them was the correct one, but I found it sad that nobody recognized it from a television commercial that was popular during their childhood. It is pathetic, in a way, that I am grasping at television commercials for cultural context. It's a new cultural low for me. Nobody recognized "Rhapsody in Blue" from its use in commercials either. I used to feel that there was a divide between popular culture and non-popular culture (the cultural stuff that made "culture" an operative term). Now I just don't know. I stopped trying to keep up back in the 1990s. I don't know how anyone can keep up now. How are we supposed to teach our students to recognize something of value in this cultural quagmire? Maybe they can recognize value when it is explained to them during actual class time, but how can we expect students to remember how to recognize something of value when they don't even have the skills (or the desire) to read the virtual map? From Haydn's house on Kleine Steingasse in the Viennese suburb of Obere Windmūhl.